on they will be known simply as Corstorphine. Goodbye Gordon - Hello Iain. over the job of league secretary to Iain Hope. 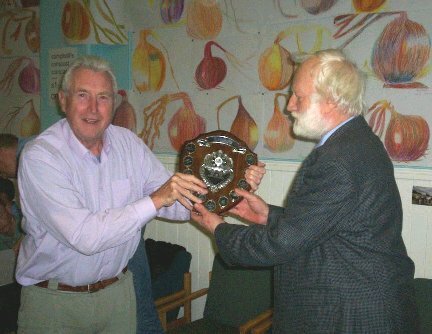 to Iain is Terry Purkins the League President. bloke who is now the President of the SCA. 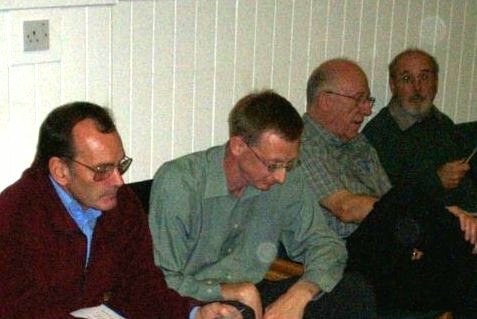 The above picture was taking at the recent fixtures meeting. 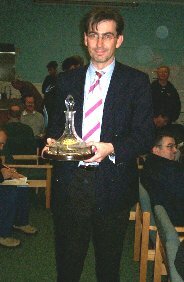 as Corstorphine Castle, for winning the Summer Cup & Summer Plate. formerly known as Corstorphine Castle. the Summer Cup and Summer Plate next er... Summer. now called Corstorphine and not Corstorphine Castle? "There is no castle at Corstorphine." came the reply. Hmmm. There is no Hill at Pentland Hills. and Lasswade Chess Club play in Dalkeith. Actually it looks more like shield than a plate. Corstorphine Castle, The club now known as Corstorphine. 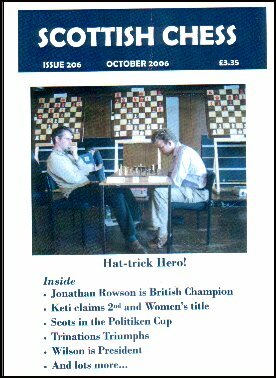 The latest Scottish Chess Magazine is out £3.35. Packed with news, stories, games and articles. players but getting them to send in games is like pulling teeth. I may have to throw this open to the whole planet. until spotting and solving them becomes 2nd nature. coming in from all angles. Look at this for 1 minute. White to play and mate. If you failed to find it then look at this. become once you have final picture. It's a variation from Alekhine - Frieman New York, 1924. Try this. White to play. Shamkovich - Atanas, Varna 1970. First the pattern that Shamkovich saw. 30.Qe7 Rg8 31.Qxh7+ Nxh7 32.Rxh7 mate. Finally we get a wee bit tricky. Here you have to spot the clever check. Now the position. Shamkovich - Botterill, Hastings 1977. 28.Rxf8+ Kxf8 29 Qc5+! Ke8 30 Qc8 mate. Easy? Yes the hard part is getting into these positions. Shamkovich had to spot the idea back on move 26 when he played 26.Ra8! Most of us would have been thinking about resigning. with all kinds of mating patterns cropping up. Kopec v Condie game, Danny has got in touch with me. his friends in Scotland well. Isn't Chess a wonderful game. seaside resort and play a game of chess. have contacted me about it. It has all his latest books, CD's and DVD's. written with GM. Lubomir Ftcnik. Batsford Books. I reviewed it for another site and gave it the thumbs up. 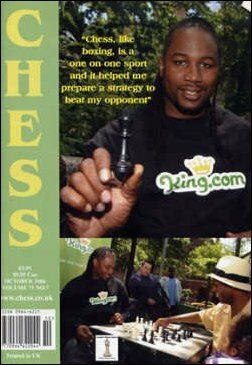 can explain why he is a good chess player. He is a very experienced chess teacher. and I stress may, I've not asked him, Work you out a deal. less experienced players. Give his site a look. What have you got to lose? Nothing. A couple of minutes. What have you got to gain? Grading points and prize money. Also out is the latest Chess. £3.95. Someone has to do me a favour here. from the manageress, (the delightful Mrs Chandler). and then and buy the spare one.Thank you. Note the cover of the October issue. of Man and yet they stick a boxer on the cover. I'm gonna punch his lights out. The October Chess is full of good things as usual. A nice article on Chess and The Prisoner. The Prisoner was essential viewing in the 60's. "I'm not a number." screams Number Six. Sounds like someone appealing about their low grade. Andrew Martin's column is always worth the cover price. This month he looks at a gambit that has no name. He titled it provisionally, The Crazy Gambit. Well every Edinburgh Chess League player will recognise it. & Todor Dimitrov (Bells) both play it on a regular basis. after 1.d4 I played 1...c5 instead of 1..Nf6 to avoid 2 g4. the daft sac which I play against Todor in 5 minute games. 1.d4 Nf6 2.g4 Nxg4 3.e4 Nxf2!? Funnily enough Andrew makes no mention of this sac. I think 2.g4 should be called the Duncan/Dimitrov Attack. Either that or the Sideshow Todd. I'll see if I can get a game or two with this line. I've been experimenting with the sister idea.